For most visitors, Cairo is about pyramids, markets, museums and mosques. But after dark, the ancient city becomes a different place. We followed Waleed, a guide with Cairo Urban Adventures (save $10 off your first Urban Adventures trip), on a four-hour trek through Downtown Cairo. Starting in the neighborhood of Dokki, we crossed the Nile River via the Qasr El Nil (translated: Palace of the Nile) Bridge, famous for its four bronze lions. The bridge lions, designed by 19th century French sculptor Alfred Jacquemart, guard in pairs at either end of the bridge. We’d previously seen Jacquemart’s work outside the Musee d’Orsay in Paris. 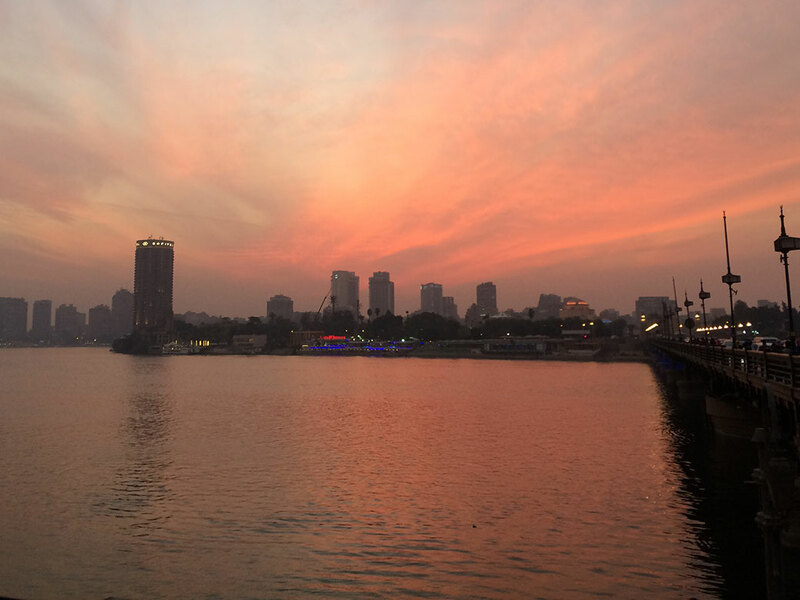 Sunset over the Nile River from the east end of the Qasr El Nil Bridge. At the east end of the bridge, I dodged the chaotic traffic to take a photo of the fiery sunset over the river. Meanwhile, Viktoria was being approached by three Egyptian schoolgirls for a group selfie as the coral Egyptian Museum loomed in front of us. 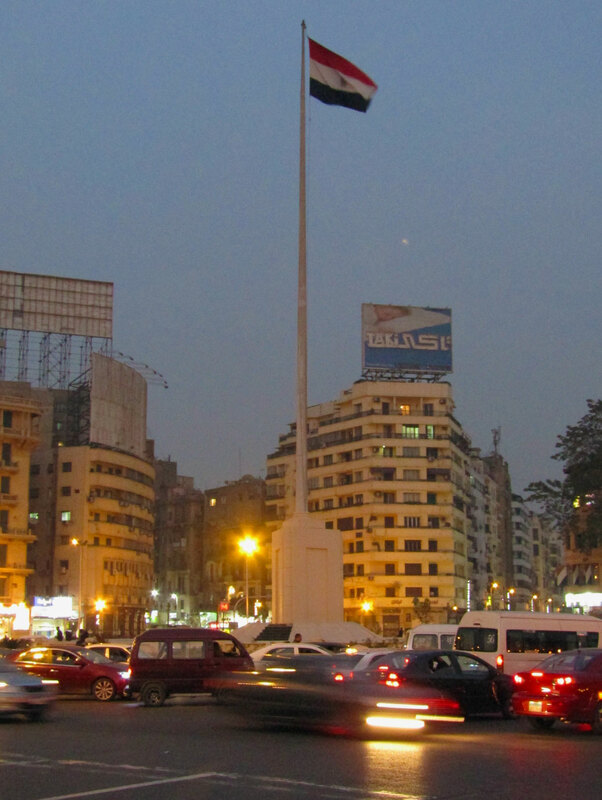 We continued toward Tahrir Square, the flashpoint of the 2011 Egyptian Revolution and 2013 protests. January 25 was the anniversary of the 2011 revolution. Depending on our destination, we’ll often act as our own tour guide, but one of the perks of local guides is hearing local stories. Waleed shared his own experience of the revolution; of guiding a tour group out of the city before returning to take a “neighborhood watch” shift to protect his apartment building from rioters. He told of the internal struggle of wanting to be a part of the movement to end the corrupt 30-year reign of president Hosni Mubarak while also worrying for the safety of his father, a police officer serving in the heart of the square. Graffiti from the 2011 Egyptian Revolution along Mohamed Mahmoud Street near Tahrir Square. Today, it’s hard to picture 300,000 people gathered in the busy roundabout, but the marks of the revolution are still visible today. Outside the American University of Cairo, a single wall of graffiti from the 2011 revolution still stands today—the rest demolished in 2015 as part of a Tahrir Square renovation project. 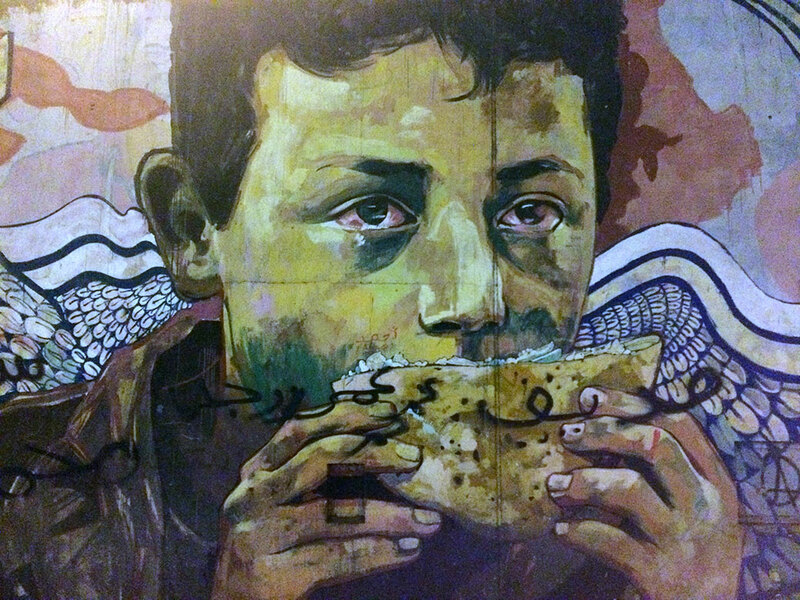 The simple image of a child eating a baladi bread sandwich flanked by a pile of skulls tells a powerful story, especially at night. 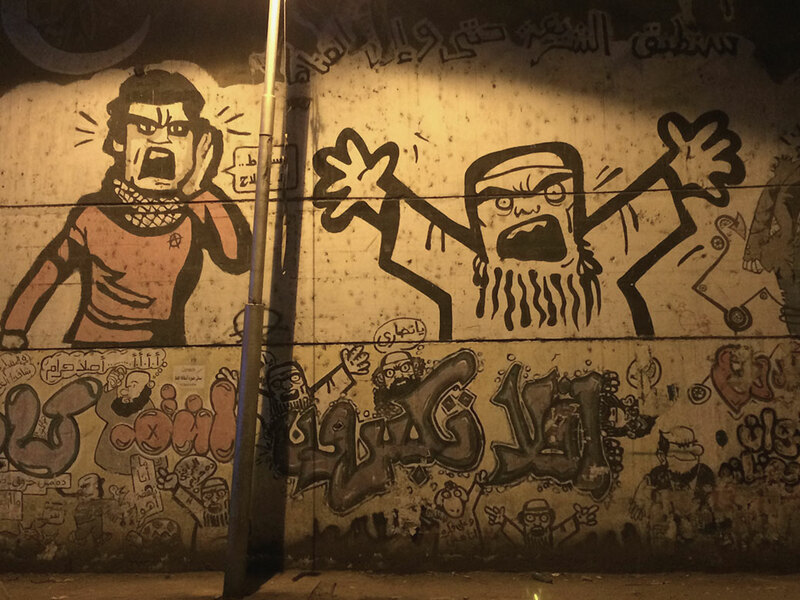 Graffiti from the 2013 protests depict the Muslim Brotherhood along Mohamed Mahmoud Street near Tahrir Square. Nearby, a more complete collection of graffiti from the 2013 protests changes the story, depicting the ire against President Mohamed Morsi and the Muslim Brotherhood in a more comic style. Waleed led us through dark side streets, describing the meaning behind the images and the messages written in Arabic. It was time to lighten the mood, which happened literally under the bright lights of historic Talaat Harb Street. After a couple hours of walking, it was time to eat, so we headed to Abou Tarek for koshari. Viktoria had already visited on a previous tour and it was on my must-eat list. I was not disappointed. The simple, filling national dish of Egypt can be found all over the city, but Abou Tarek is king. After dinner, it was time for dessert and the last stop of our walking tour. We went to El Abd, one of Cairo’s most famous bakeries. Outside, people queue for house-made gelato. Inside, fresh-baked semolina cakes, phyllo-dough birds’ nests and other Egyptian sweets are up for grabs. Visitors elbow, shove and shimmy their way through the small, crowded shop. I found a nice gift box to take back to my co-workers in Cascadia. We ended the night with one last adventure; Waleed lived in a neighborhood close to ours and offered to help us navigate the intimidating Cairo Metro. He bought our tickets for the equivalent of a nickel (five cents) and we boarded the train. As the only foreigners on the Metro, the locals met us with friendly smiles and curious stares. We made small talk with a couple of young professional footballers on our journey back to Maadi. Waleed bid us farewell a few stops before ours, ending a great night in the real Cairo.